A while back Amazon informed sellers that there will be fee increases beginning on February 22nd. You can access that statement here. Like many sellers, it was hard for me understand how this would exactly affect my business since I can be pretty thick when it comes to math. I started crunching the numbers now on individual products and I wasn't thrilled with what I saw. 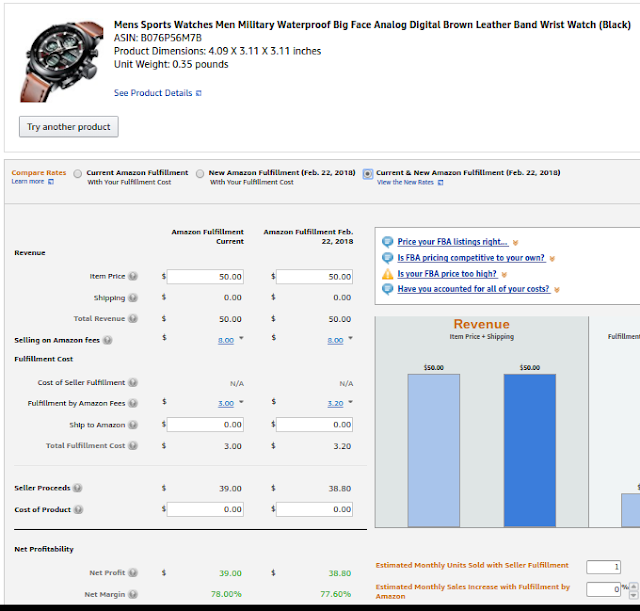 I'm going to go through some random sized products (not items I sell) to show the difference but I encourage you to do the same with your own big sellers to get an idea of how it will affect your business as well. The increases coming on February 22nd are only on the FBA handling fee, current commissions will remain. Here are some random examples of increases so that you have an idea. 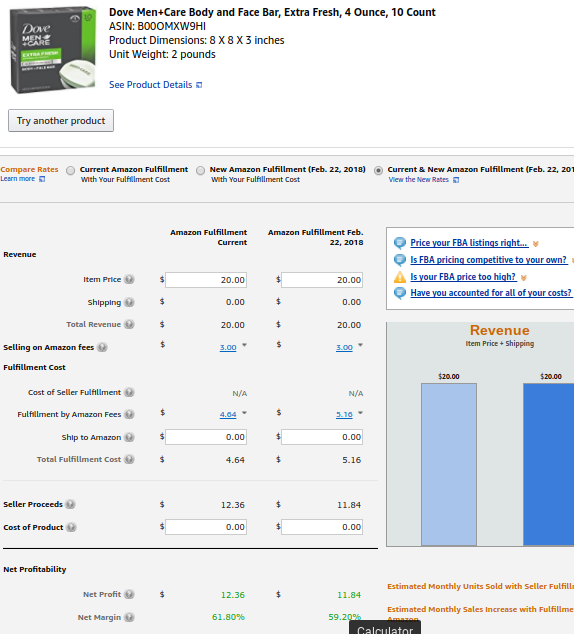 Go to the Amazon Revenue Calculator to see for yourself. Let's start with a small item like a watch. You want to make sure the box is clicked that says "Current and New Amazon Fulfillment" so that you can see the changes side by side. 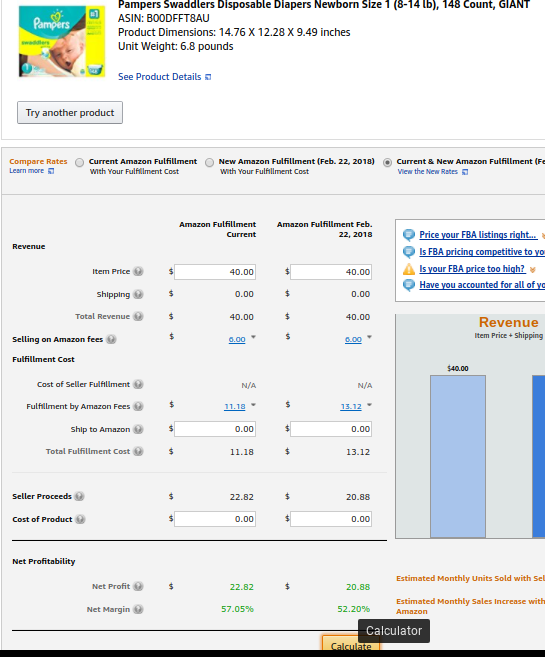 The important area in the picture is the one that says "Fulfillment by Amazon Fees". You can see that the fees are currently $3 and are increasing by $0.20 to $3.20. That's an increase of 6.666667% in FBA fees. As the items get larger, the increase per unit gets larger as well. Here is a 10 pack of soap. The fee increase on this admittedly giant size of diapers is $1.94 per unit! From $11.18 to $13.12! A 17% increase! And it gets larger as the item gets larger. Some items I sell are increasing fees by $5 a unit! It's hard to estimate exactly how this will affect you since it depends on how large the items you sell are. I'm estimating for myself that my average unit fee will increase somewhere between $0.30-$0.40. That is huge and I hope I am overestimating. Take the estimated number you come up with and multiply it by the number of units sold last year. With that you will give you an estimate of how much more you would have paid in fees last year with the same rates. If you sold 10,000 units at an increase of $0.35 a units that's $3,500 more in fees. 20,000 units is $7,000 in fees, etc. Not pretty. If you sell larger items, you average per unit will be higher. If you sell smaller items your average per unit will be lower. However the problem may be more subtle and dastardly since it doesn't account for sales you won't be making. There are lots of items that I will no longer be interested in selling unless the price goes up as well with the fees. Here is a quick calculation for you. For every dollar increase in fees, you need to raise your price by $1.17647 to earn the same amount of money since you have to account for the increased amount of commission (X-.15x = $1.00 or 0.85x = $1). If the fee increase is $.50, so then the price has to go up by about $0.59 a unit to earn the same amount. If the price just doesn't go up it may not be worth it to you anymore to sell this item. You may not be paying increased fees on that item but you are also not earning as much profit as you used to. 1) Bigger is not better! Storage fees have been increasing, especially for Q4. In the same announced Amazon said "FBA inventory storage fees are not changing at this time. We will announce changes to these fees in early 2018." You can bet that storage fees will increase and the increase will be hefty because they can. 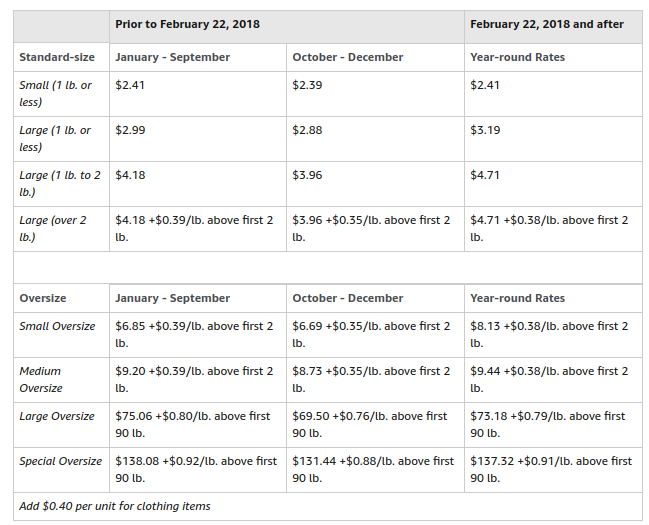 Now fulfillment fees are massively increasing for larger items. My first order of business is to focus on smaller items which I've been doing anyways and will continue to do. I will likely raise prices on many items to account for the increased fees. Consumers will feel this for sure. There are many items that I just can't afford to continue selling with increased fees. That will likely lead to decreased sales. A couple of profitable sales are infinitely better than hundreds of sales that are not profitable. There are other items that I will keep prices the same and just eat the fees since my margins are better. As mentioned previously, there are other items that I just won't be able to sell since other sellers have better margins and I can't compete with their prices. It's always been like that and it always will. It's a game of readjustment. 3) Opportunities for Larger Items will Present Themselves. As people increasingly focus on smaller items, some larger items will fly through the cracks. Opportunities will exist that I hope to exploit but I assume on a smaller scale because of the increased storage and fulfillment when I'm wrong. 4) Sell some larger items now? There are some larger items that are increasing $3-$5 in a couple of weeks that haven't been selling well. Might be time to drop prices $2-$4 and just get out before the fees increase. If you have a repricer you will need to adjust the lower extreme to make sure you don't sell for too little. 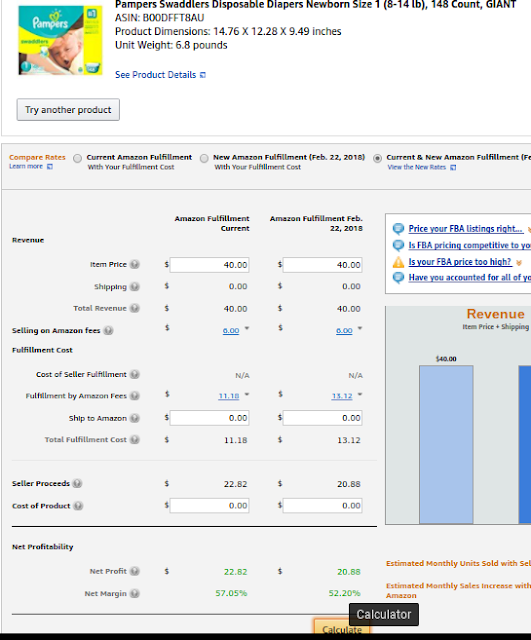 Fees are only increasing for FBA. That means the relative advantage of FBA vs. FBM is decreasing and opportunities for FBM and Seller Fulfilled Prime (SFP) will present. Just think of it as a new long term storage fee you pay regardless of how long the item has been there! Happy Selling! So, how will it affect your strategy going forward?